The 2019 IIHF Women’s World Championship will be running April 4-14 in Espoo, Finland. 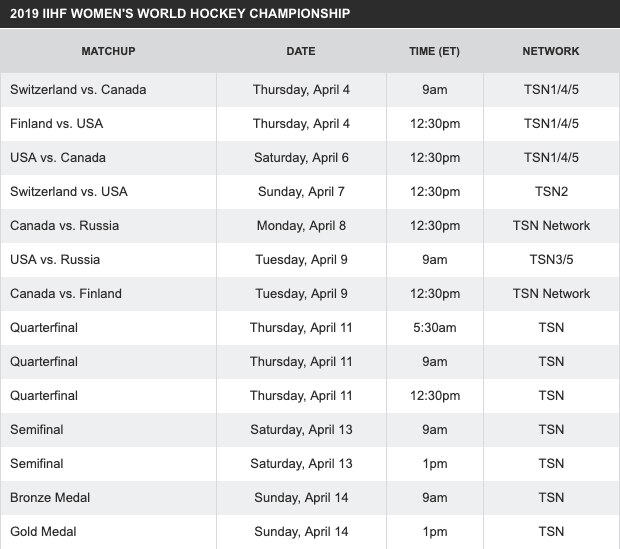 The IIHF has the full tournament schedule here. If you’re lucky enough to be in Finland, you can purchase your tickets here. This is the first year that the Women’s World Championship will have ten national teams competing in the tournament rather than eight. No team has ever been able to knock Canada and the USA out of a first or second place finish as they are the only two teams to have won gold or silver at the IIHF Women’s World Championship. Finland has come close with 12 bronze medals since the tournament’s inception in 1990. Will this year be the year Finland breaks this record on home ice? With 2018 being an Olympic year, the World Championship hasn’t been played since 2017 when Team USA took gold on home ice after they had planned to boycott the tournament during their negotiations with USA Hockey. Team USA has won the last four World Championships.